Below you will find a collection of articles written over the last 10 years on a variety of frugal living and couponing topics. eight essential techniques, every shopper who buys groceries can get the most out of their hard-earned money. shoppers pay for a good portion of their groceries using coupons and save more than 50% off their weekly budgets each and every week. container is less expensive per unit than the bulk container when used in conjunction with coupons and sales. You can see my entire price book for groceries in the Raleigh, NC area on my WRAL-TV blog at http://www.wral.com/price-book-best-prices-for-2016/15212040/﻿. the key to the greatest savings is purchasing the best sale items listed in the weekly flyers and then using coupons for those items. the register. Before you leave the store, thoroughly review your receipt to make sure you weren’t overcharged. If you discover an overcharge, head straight to customer service and explain the error. Many stores have a price scan guarantee, which means that you will receive the entire cost you paid for the item and get to keep the product. Yes, this means you will take home the product for free! Smart spenders never leave the store without reviewing the receipt and requesting the price scan guarantee, when applicable. Enjoy delayed gratification. Yes, it’s just what you were thinking. Rebates and cash back sites. You buy an item that offers a rebate or cash back refund, fill out the form exactly as required or scan the receipts and after a short delay, you get your money back. If you are thinking that it doesn’t sound so difficult, you are right! Surprisingly, many people don’t take advantage of the amazing rebates available for everything from beef to toothpaste to pasta. Smart spenders recognize that the savings opportunities are huge with the cash back sites. See a list of sites at http://www.wral.com/new-january-printable-digital-coupons/16388958/﻿. Stick to your strategy and avoid the tactics. Do you smell the fresh cookies baking in the deli? Did you taste those free samples of cereal when you walked into the store? Welcome to the world of store tactics. Their job is to make money marketing the products they sell. Your job is to steer clear of the tactics and stick to your grocery list. Don’t be enticed by the sale signs when you know something isn’t a good deal. Don’t go to the store hungry and don’t impulse-shop (unless it’s a good unadvertised buy, of course!). Smart spenders come prepared to shop for the items that will save them the most money and they avoid the clever methods designed to persuade you to part with more of your paycheck than you should. These aren’t the only money-saving techniques used by the shopping experts, but they are the basis for the very best buys. As I always say: It's your money - spend it wisely! Grocery coupons have been around since 1894 when Asa Candler handed out handwritten tickets for a free Coca-Cola drink. Over 100 years later, in 2014, shoppers saved $4.4 billion by redeeming 3.8 billion coupons, according to the Promotion Marketing Association. People of every age and income use coupons and couponing can make a real difference for a family’s bottom line. The question is: Can it make a difference for you? This article will touch on the advantages and disadvantages of couponing. From here, you can make a decision that is right for your family regarding the benefits of using coupons. For most of you, some level of couponing will make good sense. With that said, couponing is not for everyone and it’s important to weigh the pros and cons before investing your valuable time in the fine art of coupon shopping. Not to Coupon: There are many reasons people turn away from couponing or decide not to try it at all. Here is a list of perceived disadvantages that keep some shoppers from wielding their scissors and cashing in on potential coupon savings. *Couponing takes too much time. *It is embarrassing to use coupons. *Organizing coupons is too much trouble. *There are no coupons for the products we use. *Coupons are only issued for junky processed foods. *There are no real savings with couponing. perceived disadvantages are not always accurate. struggle to decide what to buy (sound familiar?). Smart spenders look through the sales ads, make a weekly meal plan, create a grocery list and match the coupons to sales all from the comfort of their home. By the time they get to the store, most of the work is done. All they need to do is put the items in the cart, check them off on the grocery list and put the coupons to the side, ready to present to the cashier at checkout. had to find extra time to coupon. much more troublesome if I could not pay my bills because I was too uncomfortable to cut coupons. your own, see more details in the article below. products that offer coupons. Remember, coupons are not only issued for food, they are issued for the full array of grocery and drug store products. Do you use shampoo, toothpaste, toothbrushes, toilet paper, soap, razors, hand soap, dish soap, laundry detergent, pasta, rice, canned vegetables, frozen vegetables, hummus, veggie soy burgers, shredded cheese, cottage cheese, sour cream, taco shells, peanut butter, jelly, pickles, ketchup, salad dressing, olive oil, or cooking spray? Those are just a fraction of the products whose name brand manufacturers offer coupons. 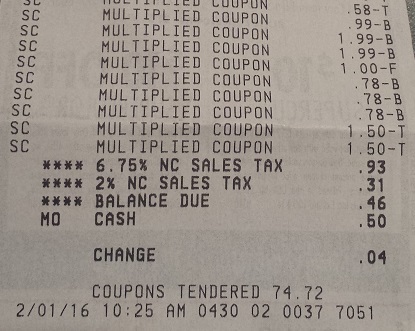 I regularly save 60% tp 100% on those items using coupons coupled with sales. sugar foods. The good news is that there are also a number of coupons for healthier foods and non-food items that most of us use. My total with tax was 2 cents for 9 boxes of vegetables! complicated than many, it is a great example of this week’s best buy. coupons for the healthier choices and non-food items so you can stock up. add up to big savings. Knowing how much we save, I expect that I will coupon for the rest of my life. *You use (or want to use) name brand food and non-food products from traditional grocery stores and pay less for them than the store brand costs. *You are willing to look at sales ads for good buys. *You are willing to clip and organize your coupons. *You are willing to make a meal plan to maximize sales and your overstock. *You want to stretch your income much farther, spend less and have more groceries to show for your efforts. I have been a couponer since 1999 and our family saves over $5000 per year by clipping those little pieces of paper. I have a stocked pantry, fridge and freezer and most of it is because of coupons. I also have a life outside of couponing, so I have found a healthy balance between stretching our hard earned income and everything else. you. Jump right in by cutting the coupons from your Sunday paper (ask for the extra coupons from your neighbors, coworkers and extended family as well) and see if you can save some real money this week on your groceries. Where Can I Find The Best Grocery Deals? especially those that may be doubled, your savings potential is even greater. good sales and loss leaders, and save more of your grocery money by shopping at more than one store each week. Loss leaders are the items that stores mark down considerably to entice you into their store. They are usually 75% - 100% off the regular retail price. They may actually lose money on these items, but they expect you to buy enough additional items to make up for the loss leaders. Your goal as a smart spender is to go in, buy the loss leaders (and only the loss leaders) and get out. week on the way to other activities, I am not wasting gas making extra trips to lots of different stores. Drug Stores – Drug stores, including CVS, Rite-Aid and Walgreens, are excellent places to stock up on deeply discounted bath and beauty items. deodorant, razors, shampoo, aspirin and cough medicine. Often, these items will be free after rebate. are determining whether to shop at these stores. you have a 50-cent coupon that is doubled, your cost is lowered to 7 cents per ounce, a 75% savings over the warehouse club price. coupons in your area, you will find some good buys at the big box stores (especially when you combine sales and coupons). Because of the all the great deals I find at drug stores and grocery stores that double coupons, I don’t often shop the mass merchandisers for groceries. When I do shop these stores, it is mainly for loss leaders and non-food items. Health Food Stores – Stores including Whole Foods and Trader Joe’s are popular for those wanting healthy food choices. Many health food stores offer organic produce and other eco-friendly products at a premium price. Not all health food stores are created equal, though. Some, like Trader Joe’s, offers great tasting organic produce and store brand products at a much lower price than many of the other health food stores. Keep in mind that many traditional grocery stores are now carrying organic produce at excellent prices as well. Not only is it important to be good stewards of our planet, it is also important to be good stewards of our own money by not overspending at high priced health food stores. stores do offer some bargains on packaged foods, cleaning and bath and beauty products. Many dollar stores don’t accept manufacturer’s coupons but some actually do accept them, including Dollar General and Dollat Tree. Convenience Stores – Convenience stores are generally not a good place to buy food. They are usually overpriced and it is best to avoid buying your groceries at the local gas station. There are times when gas stations use milk or 12-packs of canned soft drinks as a loss leaders to get you to buy gas and other items. If they are truly offering a great buy, enjoy your good deal and don’t be tempted to buy other overpriced items while there. many errands into one trip to reduce multiple trips and save gas. I usually shop at one or two grocery stores and one drug store each week. Many weeks I will also make another trip to a different grocery or drug store to pick up their loss leaders (like free toothpaste or pasta). Those trips are quick and easy and are made while on the way to other activities, so I am not making a special trip. Organized Coupons = Big Grocery Savings! finds them, she has long since left the store with the higher priced items. Sound even remotely familiar? be able to find your coupons when you need them. Many new couponers simply give up couponing because they get frustrated with organization. tremendously. There is no one method that works for everyone, but there are some methods that work much better than others. coupons expire with these types of methods because you can’t see the coupons easily. I couldn’t find the coupons I needed when I was making my grocery list and when I was shopping in the store. method is not for everyone, it is my favorite method and has worked beautifully for me. A binder organizer can hold far more coupons than most accordion files, envelopes or recipe box organizers. Expiration dates are easier to see and you are less likely to let a valuable coupon expire. you run into an unexpected or unadvertised deal (which happens to me almost every time I shop). The binders fit easily on the child seat section of the cart so flipping through the pages as you walk through the aisles is simple. Binder organizers are easily expandable. As your coupon inventory increases, add more coupon pages to your binder. Many binders have pockets with room for your sales ads, calculator, pens and store reward cards. want to add at least another 24 pages. manufacturer coupons that expired up to 6 months ago at the commissaries on base. See http://coupsfortroops.org/﻿ for locations that can accept your expired coupons. money. Don’t be surprised if other shoppers stop you in the store to marvel at your organization and fantastic savings! Are you Being Overcharged at the Register? on sale for $1 per box. Do you catch price scan errors each time they occur? big box chain store overcharged customers on 10% of transactions! Can you imagine being overcharged on 10% of the items in a full cart? the store. If you are overcharged, make sure you get a refund on the amount you overpaid. will be refunded the difference of the wrong price and the correct price for the other multiples. well. Wal-Mart used to offer a $3 refund on your order when an item scanned incorrectly, but they stopped offering that guarantee in April of 2008. They will adjust the price to the correct price if it scans incorrectly, of course. than you should. Remember, it’s your money – spend it wisely! as they would like this year. later if that good job goes away as so many others have in the last few months. Take a look at the following frugal gift ideas and start thinking about the people on your gift list. I’ll bet you can find some great matches. the-Kitchen.htm?once=true& for a number of recipes including brownies in a jar and fudge, of course! exotic spices for someone who loves to cook. giving in an inexpensive frame from a craft store like Michaels. knitted scarves, and crocheted blankets all make for impressive and lasting gifts. who has no time or energy to cook. Sometimes just helping with the everyday responsibilities is the best gift of all. Coupons are also great for kids. rental, etc. None of these outings needs to be expensive and they are great ways to spend time with the kids or grandkids. need to spend much. Even a $10 certificate can go a long way. has ovarian cancer and is being treated at Duke. Knitting Gift Basket, Gardening Gift Basket, Bath and Beauty Gift Basket (great for college students) and Kids Craft Basket. cards purchased at full price. For the last 10 years, I have bought my cards in January when the boxed sets are marked down to 75% - 90% off. stickers. Have everyone sign the cards and you will be giving a handmade gift your family will love. cards, decorations and many gifts to use next December. you stayed within your budget and avoided those high credit card bills after the holiday. Copyright 2019 Smart Spending Resources. All rights reserved.